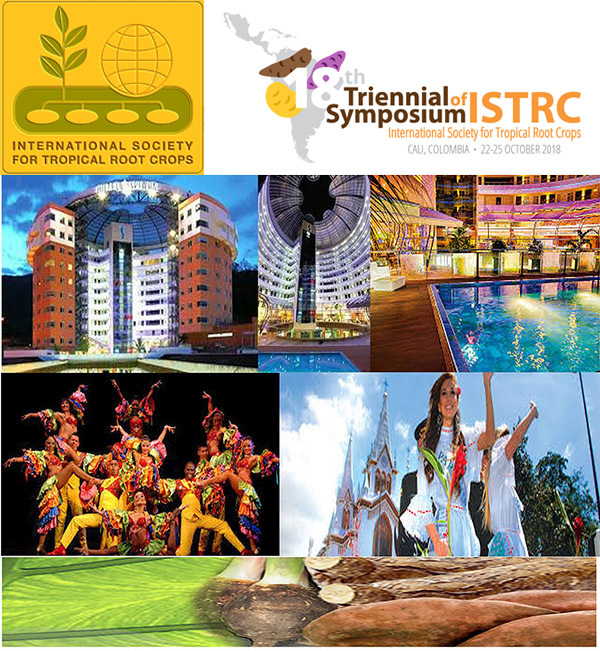 We are delighted to announce that the 18th International Triennial Symposium of the ISTRC (International Society for Tropical Root Crops) will be in Cali, Colombia from 22nd to 25th October 2018. It will be hosted by CIAT (International Center for Tropical Agriculture). A feature for both CIAT (http://ciat.cgiar.org) and the ISTRC (www.istrc.org) is that both were formed in 1967 and recently celebrated their 50th anniversaries. The ISTRC is delighted that CIAT are hosting this important symposium and very appreciate their commitment and support. This symposium will be an excellent opportunity for those interested in root and tuber crops from around the world to come together to share and compare knowledge and expertise. In particular, it will be an opportunity for Colombia and other Latin American countries to show case their expertise and for workers from other parts of the world to learn and experience first-hand.